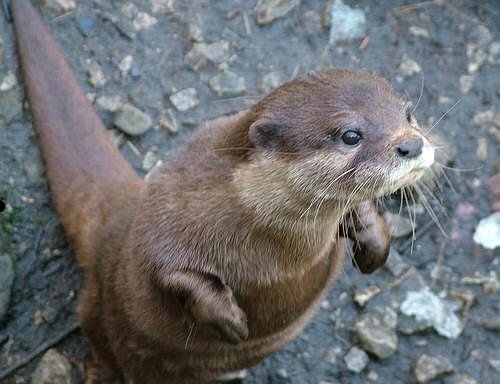 Today’s otter comes from Local Life and Little Histories, where the blogger wrote and audioblogged about a visit to the Chestnut Centre Otter & Owl Wildlife Park in the Derbyshire Peak District. This family sanctuary houses four different species of otters, 17 species of owls, and a variety of other animals. I absolutely love the femmostroppo posts–y’all link to so many *good* things, and I have no idea where you get the time to read them all. I’m dealing with a friend who seems to interact primarily through snark. I am young and socially inept and I do not know how to convey to him, in a manner that will not arouse his contempt, and in a manner which is not whiny, that I need for not *every* interaction we have–or for not *most* interactions we have– to be sarcastic or ironic or mock insults, because especially online when it’s harder to tell the tone, I’m set off balance. I’m a softer person than he is, I suppose. Any wisdom? I’m reading Pear Pear, which is a *very* unusual webcomic starring Pear and Mug, and although it’s difficult to read at first, I am absolutely charmed. I’m also reading four books: one, the aforementioned snarky friend lent to me. Deadhouse Gates is the second in a fantasy series by Steven Erikson, and it’s quite good, although difficult to remember all the damn characters. The other three books are from the women’s studies section and serve as evidence that I can’t resist buying books even when I really should hold back. Birthed from Scorched Hearts: Women Respond to War I got cheap, because I found some guy’s wallet at a bus stop, and he gave me a gift certificate to the university bookstore (goodbye, university! I flunked you good!) The others are A Hunger So Wide and So Deep and Woman’s Inhumanity to Woman. I didn’t do any prior research before buying any of these, so I’m not aware of any politics surrounding them, they just spoke to me. A Hunger So Wide and So Deep. OMG, people, if you didn’t catch Ballet Shoes on ABC last Sunday, go and watch it on iView RIGHT NOW. (I think it gets taken down tomorrow.) I just watched it and it is THE BEST THING EVER! I loved Ballet Shoes! Agreed, one of the best shows I’ve seen in ages. I’d never heard of the book, but apparently it’s a classic. Here-be-dragons, are you a Penman fan by any chance? I’m about to read The Carhullan Army by Sarah Hall, for my reading club. Because I have to wait for it to come in at the local library I’m re-reading Margaret Atwood’s The Handmaid’s Tale and it makes even more sense now than it did twenty years ago. Linda, I’m a huge Penman fan, although I’m not sure if her latest is going to get a re-read from me. It just seemed she decided she was going to do the last part of Henry & Eleanor’s story in one book, and it probably needed to be in two for the whole thing she wanted to tell. Ah well. I’m not up to speed on her recent stuff, Anna. Maybe I should put her on my reading list. I loved the Wales series, though. In 2005 I made it over there and got to explore all the significant castles. I chipped off a piece of Dolwyddelan and brought it home with me, visited Llewelyn’s crypt etc. Just amazing. I do love Pear-pear! And the artist just started it up again after a long hiatus, which is twice as lovely. There’s not much out there like it, except maybe the Perry Bible Fellowship. 1. Is he shy and using sarcasm as a shield? 2. Is he arrogant and using sarcasm as a barrier? 3. Has he received praise for this type of humour in the past, and just does not know the limit? 4. Is he depressed and views the world cynically, perhaps pushing people away deliberately? 5. Is he a really really boring person, and has nothing else interesting to say? 1. Try find a subject he’s passionate about. People treat the things they love sincerely. 3. Try using different forms of humour with him. If he’s just trying to be funny as a defence mechanism or for approval, he should pick it up too. Word puns are fun and easy, as is lolspeak. 4. State your feelings bluntly. If he’s using “mock” insults, say that you find them hurtful, especially if he’s insulting something you like. 5. If he has other symptoms of depression, a good guide can be found here. If symptoms persist, you may have to amputate. I was taken by that old lesbian couple. I could only hope to be that gentlemanly and monocled when I get older. Very nicely done, though you don’t get to find out what happens to them in the end! Today’s book recommendation: Kit Whitfield’s In Great Waters. Incredible world-building. Ballet shoes, as in the book by Noel Streatfield?? Thankyou for the Ballet Shoes rec! That was gorgeous – and Bechdel-icious! This is my new favourite word! The blog was just down for half an hour, waiting to hear back from tech support as to why. Nice to see you’re all still here! Rebekka @ #9, yes it’s an adaptation of the Streatfield book, which I just googled. I’m glad there’s at least one other book which features the two Doctors. DeusExMacintosh, just like A&F, I too regret that that Miss Dean found it necessary to sue the company. Cuz the company shouldn’t have been so asinine. Apparently they’ve lost several lawsuits in the US for racial discrimination. The company ‘image’ is overwhelmingly a white (and sporty) one.